Sometimes I find it difficult to wear a dress in the summer time without feeling too boring. 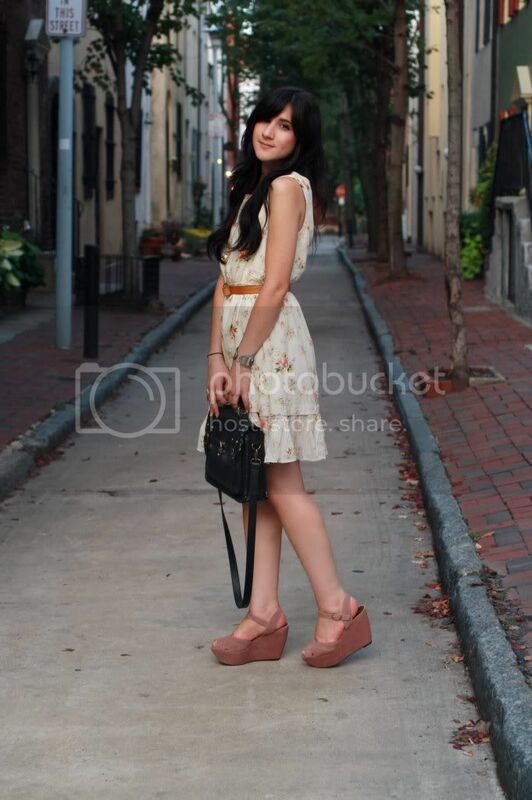 it with these blush pink wedges, aka my favorite color in the world, and called it a day. just have to do- just click on the song and it will take you to the video on YouTube! And wee, lovely songs! I'll need to listen to them all. and be safe this weekend!!! Why you so puuuuuuuuuuurty??? Gonna listen to your mixtape girl! Oh, and I need to steal music from you! I know how you feel about layering! I do feel a bit boring when I'm just wearing a single piece, but it is just too warm to do that sometimes. You look lovely - I'm in love with your shoes! You always have such fantastic taste in music, love when you share some great songs! That dress is darling and summer perfect. your outfit is fabulous and I love your playlist! we should trade mixed tapes some day, I think that would be so much fun! i love the print of that dress and it suits you so well! also a little bit in love with your wedges.. I want to have your wedges ! great outfit. The dress is adorable. I can see why you're obsessed over this dress, it's darling! And those wedges are such a pretty color. Your closet must look like a garden in spring, you own the cutest floral and detailed pieces, adora the dress! Beautiful romantic outfit ! Love the dress ! I know what you mean about not wanting to layer your outfits with the humidity, but feeling boring without layers. 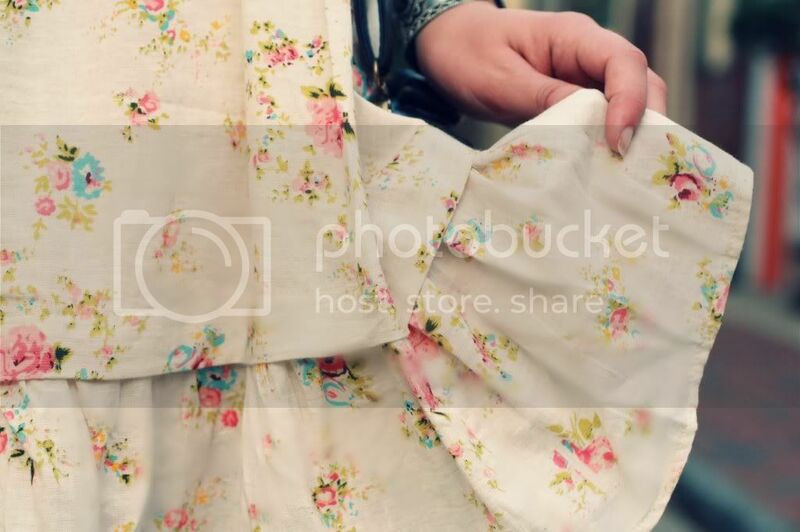 However, you look super cute in this floral dress! I love the shoes too. 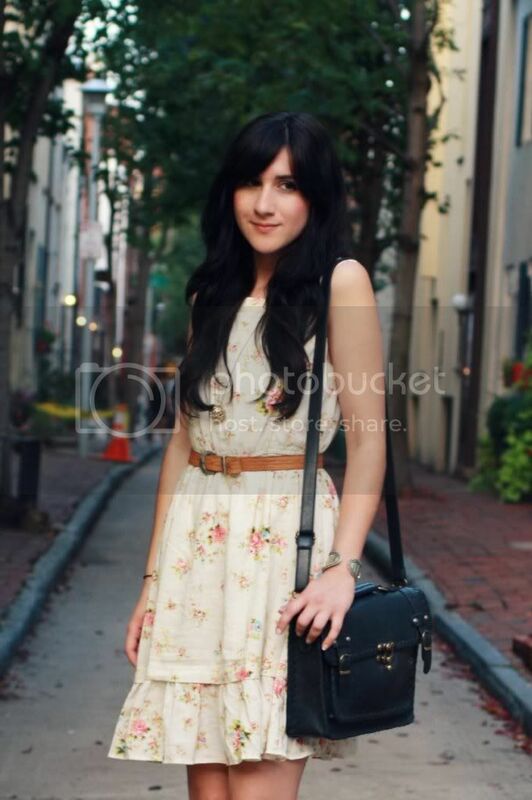 This dress is so very pretty on you, love the softness of the photographs. those shoes are the cutest, i love them! Love the color of your wedges. I especially love the combination of the delicate colors of your dress and the caramel-colored belt! I always adore your music choices! <3 Oh, and I am obsessing over your beautiful shoes! You always wear the most amazing colours! loved the delicate floral print. Such a pretty and girly dress! Such a beautiful dress on it's own, I think it's because it fits so well. if you're not already following me, you could if you like my blog and i'll follow you back. 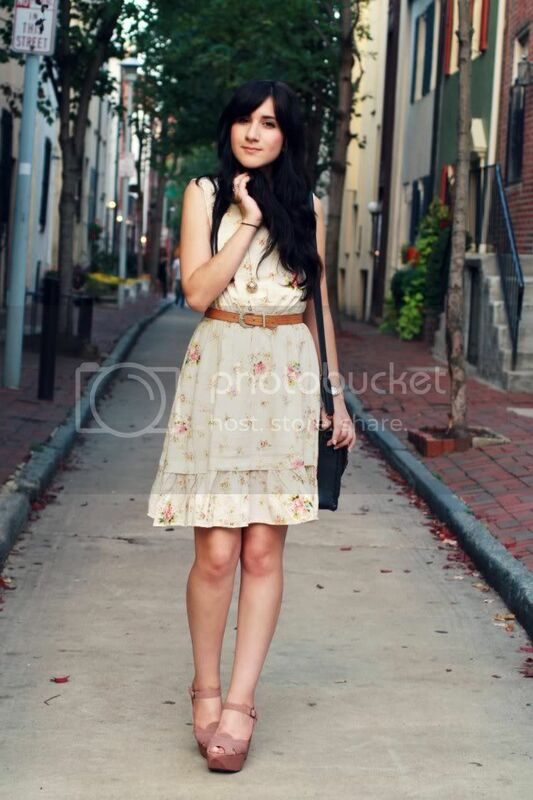 Lovely dress, Modcloth never fails. Those shoes are adorable too! Stay safe and away from Hurricane Irene's wrath. Cute dress. Hope you stay safe. Oh how I love when you go with romantic, flowy florals! They suit you so well. I love your pretty pink wedges too. Thanks for the song tips. I am an avid music lover and always welcome all new songs! love the colors of your shoes, it's almost like a dusty rose. yay i love your playlist. m ward is the best. have you heard monsters of folk? if not, listen! and i know what you mean about dresses... its like you need knee highs or a pin or anything! You make the dress look no close to boring dear. Hope you're safe away from the hurricane. what a stunning dress, love it! Bonnie, you're a deliberate style genius, even if you think just wearing a pretty dress is boring. Never! You look so stylish. And your shoes!!! Nice look! I love the dress! Cute look, love your bag. Very bohemian look! Love the dress´s print and wedges! this is such a wonderful delicate outfit. summer chic! Lovely dress! and great music picks! You've got some great songs listed! Love it! Don't worry because you can't layering in summertime, it's almost impossible. Mix a dress with some good accesories can be as stylish as layering, and it's for sure much more practical, comfortable & logical. lovely outfit! you have a great blog! such a cute outfit i adore those shoes! I feel the same way with layering. Sometimes just one piece doesn't feel complete. This dress really worked though! I love it. I have adoreeeed the avett brothers for about five or six years now. SO amazing aren't they? Have you heard the one brother's solo work too?? Really, your dress is very lovely.